Immigration procedures are not consistent for all the provinces across Thailand. Each immigration office will implement government policies in their own way which creates varying applications processes among the different cities and provinces. Thai immigration requires that foreigners do the process their visa in the city where their address of residence is located. If you are living in Bangkok and you wish to apply for a visa extension based on marriage, retirement, business or other categories, then you will need to go to any of the immigration offices in Bangkok (see table below for information on the addresses). 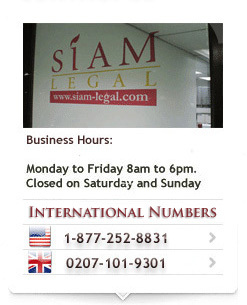 You may also contact our firm for assistance with your immigration and visa concerns. We offer a wide array of Thai immigration services in addition to other legal matters such as family law, property purchases, and litigation. Hello, I spent this summer traveling around SE Asia and I have booked my flight back to Europe from Bangkok on 27.8.2016. I crossed the border with Cambodia on the 8.8.2016 and I am eligible to stay until 22.8.2016. Is it the ay to extend it? because my flight is 5 days later. I thought that I would get the 30 days permit on arrival but I got only 15 days instead. You can visit an immigration office near your current residence to apply for a 7-day extension based on the current entry stamp provided to you. Hello, please tell me where I can find out the destiny of man, arrested for overdue visa? to whom I have to address? If the man has been arrested for overstay, you may check with the Royal Thai Police Immigration Detention Center. I’ve applied to renew my passport which will arrive in 4-6 weeks time. My 30-day tourist visa expires in 2 weeks on my old passport. I cannot leave the country with this passport. What can I do to avoid overstay? Hi, I currently just have a 30 day tourist visa and need to extend it by 7 days. Is this possible, or do I have to pay for a full 30 day extension? Whether you only need 7 days or the full 30 days, the immigration fee for the visa extension is 1,900 baht. Hi I would like to know if I can extend my business visa from single entry to multiple entry after I arrive Thailand. You may apply for a multiple re-entry permit at an immigration office in Thailand for 3,800 THB. However, if you need to extend this to a longer duration business visa, you must meet the requirements of the immigration office. You may contact them for more information about the visa extension. Hi. My Malaysian girlfriend is currently in Thailand as a tourist for 30 days. How do I extend her stay for another 30 days? She can visit an immigration office in her location in Thailand to apply for an extension of her 30-day stamp. Hi, I have a work permit already dated July 5,2016 – July 4,2017. My NON-B visa expires this SEPTEMBER 28,2016 and I cannot fie for 1 year extension because the accounting are still waiting for the release of SOCIAL SECURITY INSURANCE. In short I don’t have papers to file for extension yet. Temporarily I went out to Laos for tourist visa which expires this NOV 25,2016. My question is, do I need to file again for WP3, NON-B, even though I already have a working permit? Or I can file directly for 1 year extension as soon as the accounting staff receive the papers needed in filling 1 year extension? You will need to apply for a 90-day Non Immigrant B visa again and then apply for an extension once you are in Thailand based on the same work permit that you currently have. I would like to inquire that if I am a Malaysian who is travelling in Thailand and wish to go to Cambodia, do I need a re-entry visa if I were to enter Thailand from Cambodia? Kindly enlighten me the necessary information or trusted link if re-entry visa is needed. No, you can enter on visa exemption for a maximum of 15 days if you enter by land, or 30 days if you enter by air. I’m an Indian passport holder. I got a 15 days tourist visa on arrival from 28 September until 12 October. I wish to stay in Thailand( Bangkok) for another 10 days more until 22 October. Please advise which of the above mentioned offices I can get my visa extension done and how much time does this approximately take. A visa on arrival cannot be extended further than the period provided. You will need to exit Thailand before your visa on arrival expires and then re-enter and apply for another visa on arrival if you wish to stay longer. Hi, may I get some information regarding Thai Visa? Recently, I hold non-immigrant and it will be extended again 29 Oct 2016. So can I go to do it before or after one week during the deadline? Generally, visa extensions must be done within the last 30 days of the validity. You must not wait until after the deadline as your visa can no longer be extended once it has expired.